I've been enjoying my outdoor 'studio' so much of late, that it's been tough to sit here and post! However, I have been busy, and have posted some new photos to prove it! 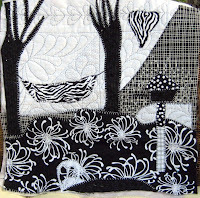 First, because what I do out there has to be handwork, I took up a black and white piece that I began when I was the 'gofer' for Pamela Allen in her design/composition class at Quilt Canada in May. I call it "My Back Yard", and like it so much that I'm going to add it to the collection in my "Nature" series, even if the style is quite different. Second, I've come up with an idea for the SAQA Exhibit, "Beyond Comfort" , wherein I'll be using recycled materials that I have on hand, but haven't really used -- except in classes about the subject. Yesterday, with rain threatening in the afternoon (it arrived early evening, actually), I got busy with some sun printing, using guidelines from 3 Creative Studios TOM (Technique of the Month) for July. I created 2 good pieces (and 2 disasters, ,which I'll recycle! 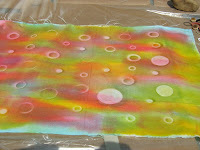 ), one of which I think I'm going to use for "Circle Play". 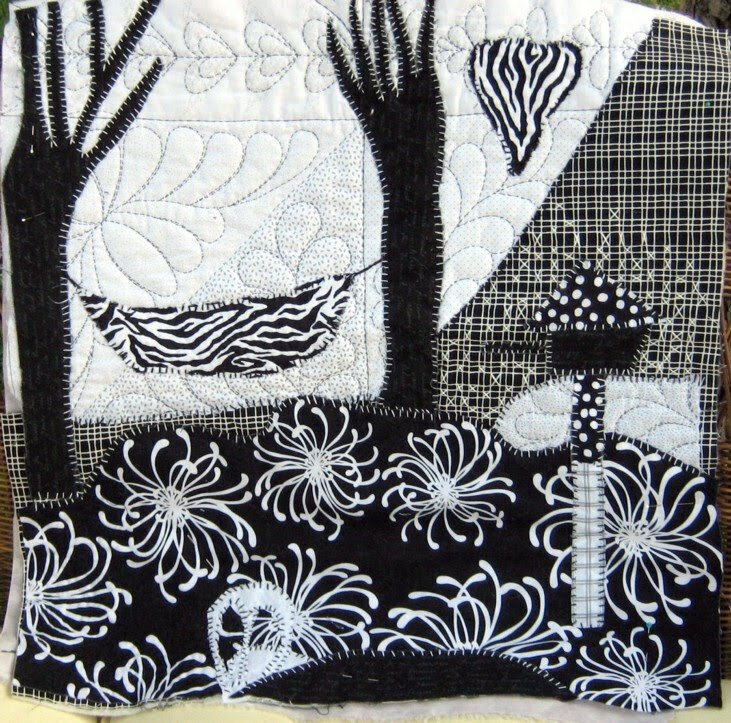 If in the end it's not accepted in the show, I've decided to submit it to "This is a Quilt", SAQA's 2011-20121 Travelling Trunk Show.